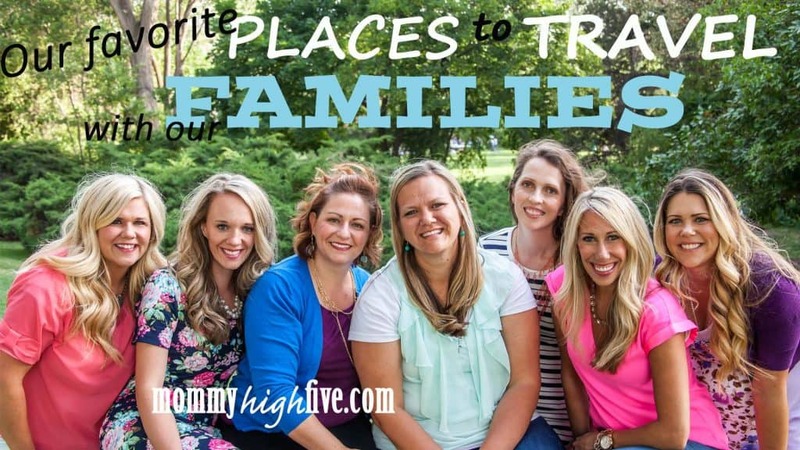 The kids are out of school and it’s time to plan a family vacation! Where should you go? What should you do? Here are seven good family and kid-friendly vacation spots that provide fun for everyone. 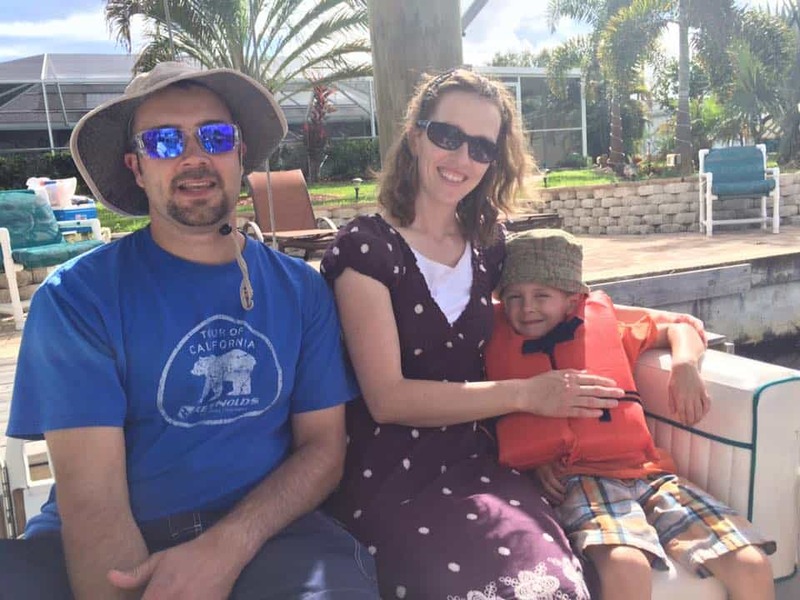 The Southwest Florida Gulf Coast is our favorite family vacation spot. We especially love to go during our cold winters. 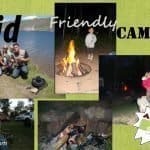 With a great variety of fun and relaxing things to do, you are sure to please everyone. Whether it is splashing around in the ocean, looking for sea life, taking a bike ride, or one of a dozen other exciting adventures, your family will make great memories. One of our favorite activities is looking for shark teeth. Some of the beaches where we have had most success are Blind Pass Beach, Stump Pass State Park Beach, and Venice Beach. Finding shark teeth at the right beach is really quite easy. You use a metal pole with a net on the end, scoop the sand at the water’s edge, dump it out on the beach, and find the teeth. Our kids come home with dozens of shark teeth to give to their friends. If you’re like me, you enjoy getting away from all the tourists. Take a charter boat from Punta Gorda to the island of Cayo Costa. It is a beautiful island with no restaurants or major shops (there is a small gift shop with drinks and snacks). Walk along the beach and look for sea turtles, fish, and other sea life along the shoreline. Be sure to take a picnic and some water. Sanibel Island is a tourist’s dream. It has beautiful beaches and is famous for amazing seashells. The island is covered with biking trails, and you can rent bikes at several places around the island. There are also some fabulous restaurants, golf courses, and boat rentals. Fort Myers is home to some more fantastic beaches. It also has the Imaginarium Science Center, which is great for kids. A tour of the Edison Ford Winter Estates is a great learning experience as well. When you think of Florida for a family vacation, look beyond the theme parks and go enjoy the Southwest Gulf Coast. It will be a relaxing vacation you will want to repeat! I love NYC. In fact, NYC with kids is the best! While some may not consider it for a family vacation destination, they should. And if the expensive of the city is what deters you, don’t let it. One of the beauties of The Big Apple is that there are so many incredible things to do, many of which are free! 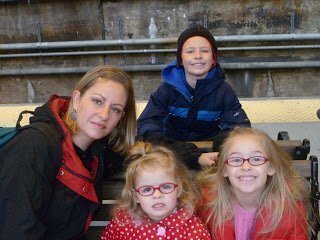 About four years ago, our family was lucky enough to live just 25 miles out of Manhattan. Living there for a few years afforded us the opportunity to visit the city often. It is hands down one of my most favorite cities in the world. While I’m no “New Yorker”, I have a pretty good feel for the city and things to do and see. Central Park in Uptown is not just an amazing expanse of green in the middle of a major city, but offers people of all interests and ages things to do. If your kids are older, I would recommend renting bikes and riding around Central Park. You can get on and off as you like. Central Park covers more than 800 acres, so it’s impossible to see all that you’d like to in an entire day. At the North end of The Mall you can see various musicians performing. Climbing around on the boulders that sit throughout the park is one of my kids’ favorite things to do. The Natural History Museum, just across the street, is the most visited attraction in NYC. Kids and adults alike love it. In Midtown is the iconic Times Square. A must do for your kids (or you) is to visit the Hershey’s store. Who doesn’t want to see all the Hershey candy goodness, but in giant size? I mean, a 1 lb. Reeses Peanut Butter Cup? Other fun places to see in Times Square, particularly with kids, is the M&M factory, the huge Disney store, and the many souvenir shops. Just a stone throw from Times Square is Broadway. Seeing a show can be pricey but worth it. If kid-friendly is your priority, “The Lion King” is sure to please. The music and costumes are incredible. “Mary Poppins”, unless it’s your favorite story of all time, wouldn’t be my pick, as it doesn’t have the entertainment value others shows have. If you have teens, I would recommend “Wicked”! It’s incredible. And finally, while I haven’t seen “Something Rotten”, critics give it 5 stars, and I’ve heard it’s hilarious. Supposedly even younger audiences would find it entertaining. Rockafeller Square would be next on my list. Home of NBC studios, the tree at Christmas in all its glittery glory, 5th avenue, and The Plaza, it’s a place worth seeing. If you’re looking for amazing views and photo opportunities, I would pay to go to The Top of the Rock. From here you will have views of the Empire State Building and Central Park. Downtown moves away from the touristy stuff. I would recommend a visit to the 9/11 Memorial or plan to get tickets in advance for the museum. Visiting the memorial is worth the visit. It’s a beautiful, moving place to reflect upon all that happened there. A visit gives an opportunity to talk to your kids about what happened that day. Walking across The Brooklyn Bridge is a must do. It’s not only free but family friendly. The walking path is above the cars, so while you can see them whizzing past you below, that’s as close as you get to any cars. If you walk the one mile across to Brooklyn, take time to sit down for a “slice”, and if you have a larger group, ask for a “whole pie”. If you want to look like a local, make sure to fold that big ol’ slice in half like a taco and, eat from the tip up. Close by is the Staten Island Ferry, that takes you for FREE, from lower Manhattan to…yep, you guessed it, Staten Island! It’s a short 20-minute ride across the water, and gives great photo opportunities, including Lady Liberty. Oh New York, how I love you! Have you been? What do you love? Spending your days by the pool is relaxing and fun and takes away the pressure of having to constantly be doing something on your vacation. Ah, the sun is shining, the palm trees are swaying, the kids are laughing, and I am sipping a drink by the pool. Yup, life is good. Where are we you ask? We are in sunny Palm Desert, California. We took our kids here a couple years ago and they were pretty young, but they still talk about it and how fun it was. Palm Desert is a somewhat quiet resort town, but it has a lot to offer within the town and neighboring towns. I grew up vacationing here with my family and was so excited to take my kids. It is a golfing town, so if you like to golf you must go. I remember going with my dad when he would golf and I would get to drive the golf cart for him. It is one of my favorite memories of this place. When we go, we stay at the Marriott Vacation Club timeshare resorts. There are many places you can stay in Palm Desert or Palm Springs but for us a timeshare, which is a condo, is the way to go. With five kids, everyone just needs a little space. The Marriott offers a kids’ club with activities and crafts for them to do throughout the day, and the pools at the resort are awesome. You can order drinks and food poolside all day long, and it is a very family friendly place to be. Palm Desert is very hot. We went in early March and it was the high 80s all week long. Compared to our Utah weather, it was perfect for us. In the summer, though, it gets extremely hot. When I was a kid we went when school got out in early June and it would already be 110 degrees. So if you plan to go there, check the weather and if you don’t like the heat, don’t go in the summer. 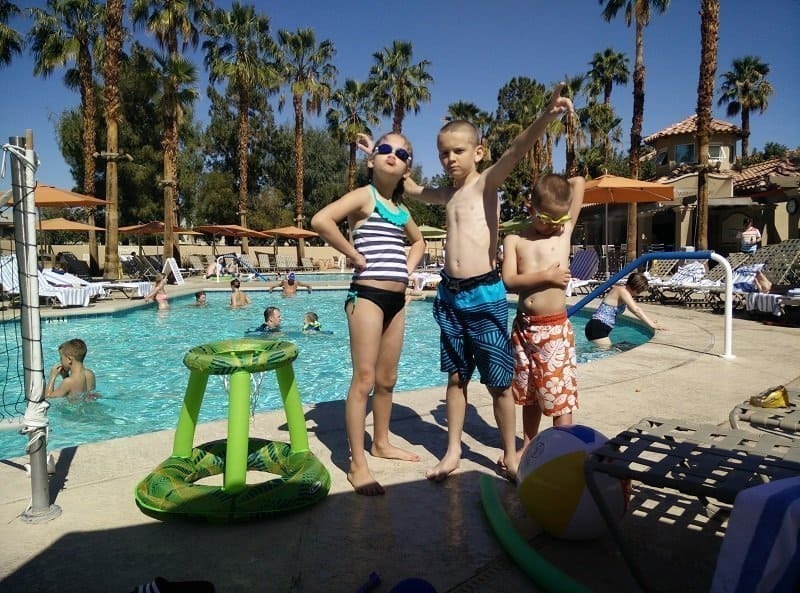 If the hotel you choose has a pool that is not quite what you expected, there is a fun aquatic center in Palm Desert with a little splash pad area, kid pool, and some slides that the kids will enjoy. There is also a children’s discovery museum that provides great entertainment in town. One of our favorite things that our kids loved to do was simply driving over to the JW Marriott hotel property. Sounds so super easy and silly, but out front of the hotel, they have 50 or so flamingos that you can so see. And as you walk into the hotel, there are two large talking parrots that you can get really close to and visit with. As you walk into this beautiful hotel there are quite a few talking exotic birds that you can get the chance to meet and visit with. They also have a little boat tour that you can take around the hotel grounds. It’s so cute and so fun. You also must eat at Don Diego’s. It’s a cute little Mexican place with yummy food. Every kid gets a toy just for coming in, they don’t even have to order a kid’s meal. I’m talking like a big ol’ toy like a bubble gun or a large push truck, not a McDonald’s type toy. If you are looking for something a little more adventurous you could hop on over to Disneyland for a night or 2. Disneyland is around 100 miles from Palm Desert and takes around two hours to get there. This would be a great addition to your trip. If you would like to add this aspect to your trip I would suggest doing Disneyland first. You will have a blast exploring all that Mickey has to offer and then you can drive on over to Palm Desert to relax and unwind before you have to head home. My kids are begging to go back to Palm Desert. We spent our days and nights swimming, playing games, and just being together. We made some great family memories we will treasure forever. If this is what you are looking for, I highly recommend going. If you are a golfer, this is your paradise. 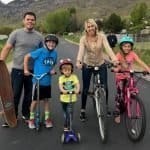 When I’m planning a vacation with my young children, I want to expose them to sights and cultures that they don’t get the opportunity to experience here in Utah. While we have breathtaking, world ­renowned mountain scenes that surround us, sometimes a girl just wants to play on the beach! Puerto Rico is the perfect destination to experience the Caribbean with your family. There is NO PASSPORT REQUIRED to travel there. It’s much less expensive and less crowded than almost any other tropical island. You can surround your family in Latin culture in the safety of the U.S. and use our own currency. My husband spent two years living on the Island of Enchantment and it is our go­ to destination for an unforgettable trip! When I go to the Caribbean, the number one thing I want to do is hit the beaches. I want to lay out my towel on the white sand and watch my kids build sand castles while my husband body surfs in the bath-warm water. Sounds perfect, right? 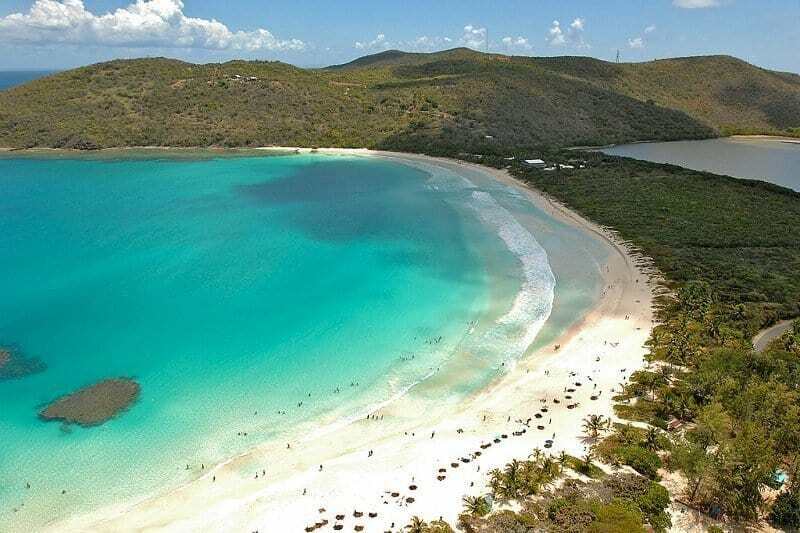 Hands down, the best beach on the island is a short ferry ride away called Flamenco Beach on Culebra. It’s consistently ranked one of the top five beaches on Earth. The gentle waves in a scene surrounded by palm trees and turquoise waters are perfect for families with young children. One of the most fun beaches with kids is called Crash Boat Beach in Aguadilla. Its unique location makes it a great spot for snorkeling, exploring, surfing, and just relaxing by the beach without having to take a ferry to get there. Honestly, you almost can’t go wrong when you pick a beach on this gorgeous island! Each beach offers something special, whether it’s the food, surf, or sand. Luquillo Beach, Pine Grove Beach, Boqueron Beach, Vieques are a few that are definitely worth your time. One of my most cherished memories was made in El Morro in Old San Juan. 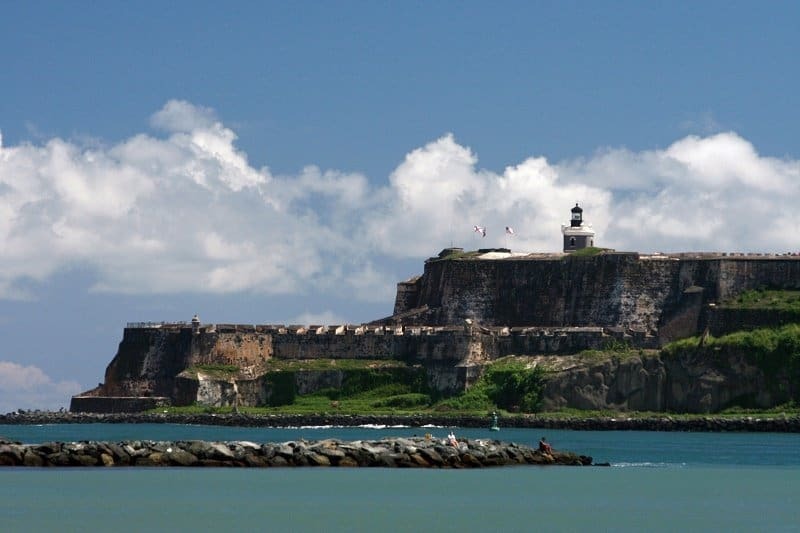 Picture a 16th century Spanish Fort surrounding a huge grassy open space where children are flying kites in the constant ocean breeze, all enveloped by breathtaking Caribbean views. El Morro is a MUST DO in Old San Juan. El Yunque National Forest is the only tropical rain forest in the U.S. It is unlike any other place I’ve ever been. Where else can you go to a rainforest in the morning and then spend the afternoon at the beach?? It’s surreal. The kids will love listening for the infamous Cokie Frogs and climbing up the observation tower to take in the awesome rain forest views. Taking the kids to do a Bioluminescent Bay kayak tour Fajardo is certain to make memories they will never forget. These types of tours are usually for kids six and up. The tours are done at night so you get a sense for how truly amazing it is to see the water light up as you glide through the water. Summertime, when its isn’t raining, is the best time to go on a Bio Bay night trip. I LOVE Puerto Rican Food. Its very unique, with influences from Spanish, Cuban, American, and African cuisine. Puerto Ricans make their traditional food with pride and it doesn’t disappoint! A few of my favorite places to eat have been found on the streets of Puerto Rico out of food trucks and handcarts. Dishes you HAVE to try are Arroz con Dulce (sweet rice), Arroz con gandules y lechon (yellow rice with pigeon peas and pork—a national dish), Mofongo (a yummy garlic­ky mashed plantain dish), and tostones (fried smashed plantains that are the island’s signature side dish and my personal favorite!). 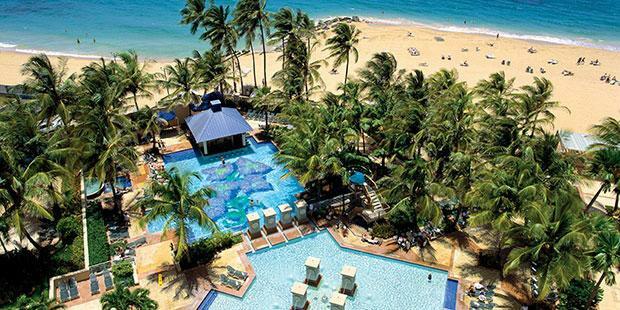 There are dozens of family resorts to choose from in Puerto Rico. Some are extremely pricey and some are a little too dicey. When we have traveled there as a couple, we stayed in a boutique hotel and it was the most romantic setting I have ever been in. 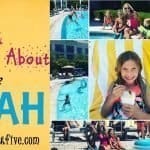 For a family, we loved the San Juan Marriott Resort Stellaris Casino. It’s right on Condado Beach and comes complete with lots of family activities during the day and a fun Puerto Rican Dance party in the Hotel Restaurant at night. After endless research, the best bet is to use Air B&B or VRBO. There are literally hundreds of beachfront properties available for a screaming deal all year round! Puerto Rico is easily one of my favorite places to travel. I feel safe when I go there and the locals are eager to speak English to friendly travelers. I love this little island and the diversity of experiences I can have with my family there! Puerto has certainly earned its nickname for me: La Isla del Encanto. I was enchanted the moment I first arrived! 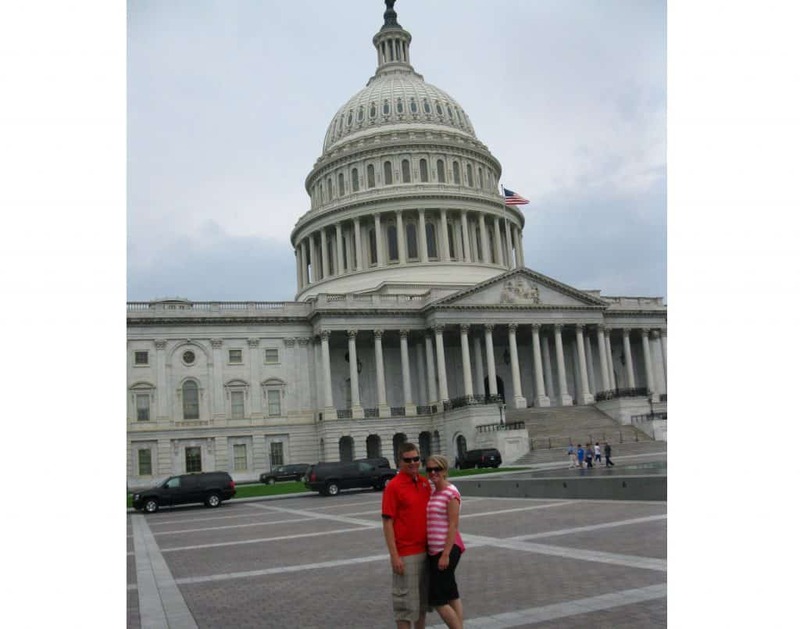 When you think of D.C. you may think of a fun filled American history vacation. That is partly right because in addition to visiting the many monuments, museums, and memorials in the area there are always plenty of festivals, food, and interesting events for all. My family has visited the area on several occasions and we always manage to find new treasures each time! First, I would do all of the free well-known monuments and memorials including Jefferson Memorial, Lincoln Memorial, World War II Memorial, Korean War Memorial, Vietnam Veterans Memorial, Franklin D. Roosevelt Memorial, and Martin Luther King Jr. Memorial. Don’t forget the other memorials or tours that require tickets: Washington Memorial, a tour of the Capitol Building, and the tour of the White House (which we weren’t able to do last time because they canceled tours at the time, but it looks like they are up and going again). Make sure to do your research well in advance for these tours because some of them require you to contact your local members of congress to get tickets and may take weeks to acquire. In addition to the many memorials and monuments that line the National Mall, the Smithsonian Institute has many amazing museums that anyone can find something new to learn and enjoy. The Museum of Natural History, Air & Space Museum, American History Museum and several others are great ways to add some education and wonder to your next family vacation. They are also great places to experience some AC, drinking fountains, and bathroom breaks! One of my favorite excursions, that I found very fascinating, was The Bureau of Engraving and Printing to see how money is made. Who doesn’t love money, right? The tour takes about 30 minutes. They show a short informational video. Then you get to walk through the factory and see it with your own eyes! It was pretty neat to see so many bills in one setting. They do daily tours and the tickets are free but are on a first come first serve basis, so I would get your tickets first thing in the morning to make sure you get in to see it! Another fun activity to do with the kiddos is the National Zoo, which is so large and fun to see! It has over 2,000 animals and spectacular exhibits. Due to the fact that this zoo is a Smithsonian, it is free…that’s right, folks, I said FREE! They do charge a $22 dollar parking fee, but that is not bad for an event that all family members can participate in and will have a blast. A must see on our list was Ford’s Theater, where Abraham Lincoln, was assassinated.They also have a museum in the basement to learn more about Lincoln’s life, The Civil War, etc. This tour is also free but does require a ticket so make sure to get there early or reserve ahead of time! What vacation would be complete without good food, right? Has anyone heard of the show DC Cupcakes from the TLC channel? It is about two sisters that have opened up this cupcake shop called Georgetown Cupcakes who is known for some of the best cupcakes ever! You have got to check it out and taste those delicious little pieces of heaven!!! Washington D.C. should most definitely be on the list of “must see at least once in your lifetime”! This area has so much to offer with hundreds of things to do and places to see. There is always plenty to do no matter what time of year that you decide to visit. I have only touched on a few, but I could go on for days and days with so much more to see throughout the area! Make sure to get your good walking shoes on and be ready have a fantastic time exploring our nation’s capital! While there are many things to do in San Diego like wandering around Balboa Park, San Diego Zoo, Sea World and so much more, our family’s favorite thing is visiting the Historic Old Town. Here you can wander around old historic buildings, tour free museums, visit shops run by local artisans, and eat at over 25 amazing restaurants within one square mile. Our favorite place to eat is Barra Barra Restaurant and Saloon, especially if it is Taco Tuesday! There are also various paid tours you can take including ghost tours of the Whaley House, which has been said to be the most haunted house in America and the Adobe Chapel, which my older kids (ages 12 to 17) want to do on our next trip. 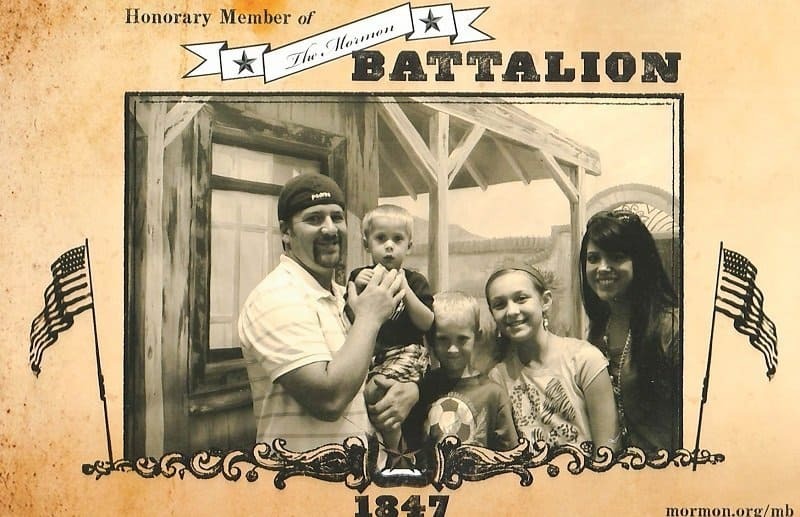 You can also learn about the history of the Mormon Battalion and pan for gold! This is a favorite for our younger kids (ages 4 to 8). Next time you are planning a trip to San Diego make sure and include at least one day in visiting and exploring Historic Old Town; our family never regrets it. I lived in Hawaii for a year and a half going to college. It was as awesome as you would think. I remember going to the beach and laying out before class and then quickly putting my clothes back on and going to my next class with sand between my toes. After I graduated we went back as a family with our oldest, who was only one at the time. My husband and I went back again for our 10 year wedding anniversary. We had a ball. It really was a dream vacation with just the two of us. We will be taking this dream vacation again this summer with our entire family. To me, there is nothing like the Aloha Spirit that Hawaii offers. Wearing a fresh flower lei, sipping a yummy drink, and listening to Hawaiian music on the ukulele. There’s nothing else like it and Hawaiian nights are the best ever. A Hawaiian Sunset on the beach is unmatched. 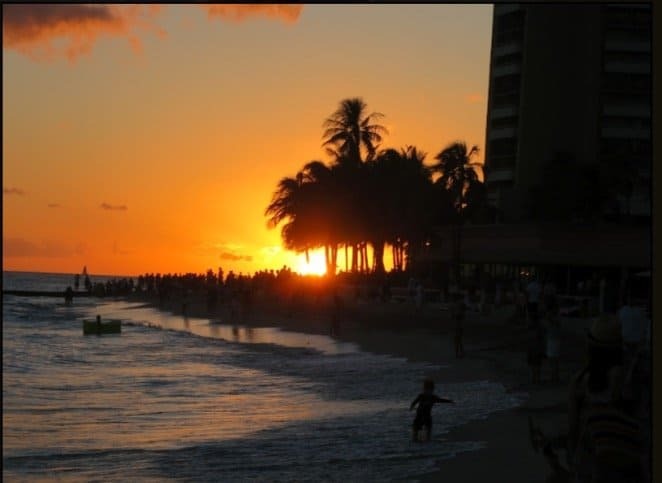 Sitting and watching the sunset after a full day of fun is what relaxation and Hawaii are all about. You’ll have the best pineapple you’ve ever eaten and the juices are amazing: guava, mango, and more. Even when I’m not at Hawaii I like to imagine myself there. I just put Hawaiian music on my phone, Pandora, or music playlist and it’s a little slive of heaven. At the North Shore on Oahu, a must is Ted’s Bakery. Do yourself a favor and get the Chocolate Haupia Cream Pie. You might not think Hawaii and pie, but this a local favorite and worth every bit. It is by my personal favorite beach in North Shore, Sunset Beach. It isn’t crowded, and the water is as blue as ever. It reaches for miles and of course, makes it the perfect spot to sit and watch the sunset. When you’re ready to eat lunch, another local favorite I highly recommend is Giovanni’s Aloha Shrimp truck. It is amazing and you will love it. I’m not the person that would brave eating shrimp out of a truck with graffiti all over it, but here is the exception. Enjoy a time at the Dole Pineapple Plantation and the Polynesian Cultural Center (the PCC). They have the best luau on the island. Don’t do any of the luaus in Waikiki unless it comes with your hotel stay. When you’re back in Honolulu, it’s very fun to see Pearl Harbor. It makes for a great day and you learn a lot of amazing information. They do a great job with this museum and you get to go on beautiful big ships. A very fun and moderate hike is Diamond Head. It is fun to get out and stretch and do a little hiking and the view from up top does not disappoint. For dining, enjoy dinner at Dukes. Sit on the back deck and make sure to have the Hula pie. Enjoy the stunning views of the turquoise water and watch the surfers while you eat. It is a little slice of paradise that only Hawaii can do. Hopefully this summer you’ll be able to get out as a family and create some experiences that your kids will remember. Enjoy each other. Laugh. Have fun. Make some memories. Be sure to comment below and tell us your favorite spots to travel as a family.